Each mic has a different set of characteristics that it imposes on every sound, based on its characteristics—type, size, pickup pattern, grill, capsule, frequency response, and a number of other things. So no matter who is singing, make sure to try several mics. Dynamic vs. Condenser: It’s good to know the fundamental difference between a dynamic and a condenser mic. Dynamic mics are reverse speakers. When sound hits the diaphragm, it vibrates, which moves a metal mass (with a coil) through a magnet, which creates electricity via electromagnetic induction (thank you, Faraday). Condensers are loaded with 48V already, and have a super-thin diaphragm that simply varies that voltage; it’s like having a cup of water always ready to spill over, and any tiny movement sets it off. Because of this low threshold of response, they respond faster to the sounds received (transient response). So, which one do you use? Dynamics are great if the singer is being recorded with other sounds nearby since it will only pick up what’s close by. They also do a better job of cutting through other sounds, since they are usually less warm and open. If you have a singer who isn’t completely trained, they can hide some small issues (nothing to rely on though). Condensers work best in a well-treated room, where the singer is trained and isolated. If mics pick up errors like a microscope, then condensers are electron microscopes. It’s a double-edged sword, as the good is also emphasized (assuming you’ve matched the right mic to the singer). They also sometimes warm up the sound a little (depending on the specific mic). Pickup Patterns: Most vocal recording is done with a cardioid pattern since it’s directional. It rejects reflections that come from behind, and dynamics also reject sounds that come from far away. Assuming you have a cardioid mic, you’ll need to use a pop-filter, rotate the mic off-axis, or not sing directly into it; this avoids the explosive pops that come from the burst of air in plosive sounds (for “p,” “t,” “b,” and “k”). You also need to be aware that if you get really close to the mic, your voice will sound boomy (the proximity effect). If you have an isolated environment though, omnidirectional mics don’t have near as much of a problem with proximity, plosives, or sibilance (the “s” sound). Omni-directional mics also pick up the room sound in a way that’s closer to what you would hear if you were standing in the room. Frequency Response: Some data you should get a hold of is the frequency response of the mics you own or are considering. This is usually a number that states the extreme range of what frequencies the mic picks up, and a chart detailing how the pickup varies at each frequency in the range. 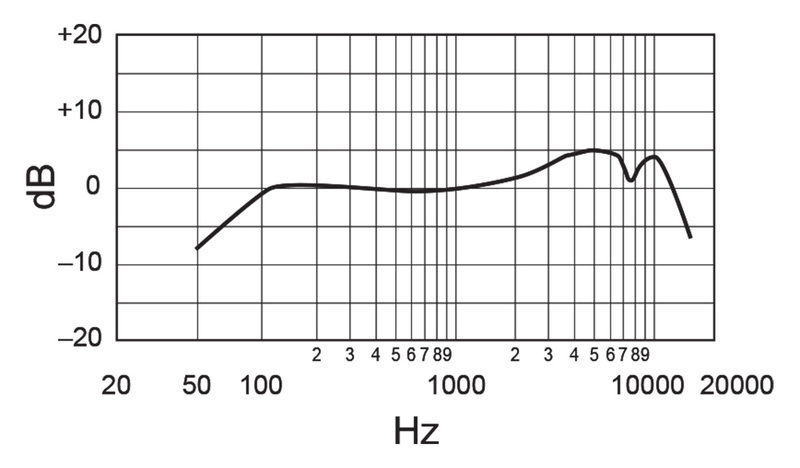 For example (see chart), a Shure SM58 rolls off bass frequencies starting at 100Hz, and picks up nothing below 50Hz; it has a boost that starts around 1.5K and peaks at 5K (+5dB), dips at 7.5k (to reduce sibilance), and rolls off after 10K, with nothing above 15K. This is a common response for vocalists, peaking where the voice really shines and dipping to avoid rumble and sibilance. The surest way to pick the right mic for a given singer is to have them sing into every mic you have and listen to decide which sounds the best. However, if you want to save some time, record a vocalist with your most transparent mic available (flat response) and then apply EQ until they sound the best. At that point, you will have identified which frequencies compliment the singer, and which ones accent the poor qualities in the voice. Compare your frequency response charts to what you now know, and you should be able to tell which mic will need the least amount of EQ when used with that singer. With practice, you’ll learn which mics to test first with each vocal type and genre. Dynamic: Shure SM58 or Sennheiser e835. Large-diaphragm Condenser: Rode NT1-a or Audio-Technica AT3035. Pick one or the other, as both mics in both categories are almost exactly the same. The SM58 is a legend, but some prefer the newer e835; they’re about the same price. The NT1-a is also a legend, and has an extremely low self-noise, but is more expensive than the AT3035; both are almost flat. These mics are great for beginners, but if you have a large budget, look at more expensive models (up to the gold standard Neumann U87, which costs around $1,800 used/$2,900 new. A lot of mics are perfectly good if purchased used, so it’s worth shopping around. EQ Primer: Since I’m talking about how to record vocals, you’ll need to know a little bit about applying equalization to the sound. This technique assumes you’re using a DAW plug-in for your EQ, and is referred to as subtractive EQ. Choose an EQ with multiple bands (at least 3, but preferably 5 to 7) and make them all very narrow. As the vocal track (and only the vocal track) plays, take each band individually, at +10dB or more gain (so it’s overkill), and slowly sweep from its lowest to highest frequency and back again. Stop it where the sound is the worst, and then drop it into the negative at that spot until it sounds best; sometimes, you’ll have to widen the band to hit larger messy spots. Repeat for each trouble frequency. The theory with subtractive EQ is that when you’ve taken out all the bad, the only thing left is the good, which can then be brought up to whatever level you need (outside the EQ plug-in). If you’ve picked a mic that really compliments the vocalist, there shouldn’t be a lot of EQ. If you only have one mic for every style and singer, EQ can solve a lot of issues. Make sure to come back to your EQ after a good break to listen to it with fresh ears. The longer you work on a project, the less objective your hearing, since the ears literally get tired out, and you form opinions as you work. There are a lot of programs and apps that can help train your EQ ears. The one I recommend is TrainYourEars. It plays your own audio (or theirs), applies various EQ curves to it, then asks you to try guess what they did. If you get it wrong, it’ll let you immediately hear what it would have sounded like if you were right (among other quiz modes). It’s pretty good for schools, since it’s a standalone app that won’t fail at the next update. Before recording, make sure you thoroughly understand gain staging to keep noise low and to avoid clipping. Also, an undesirable sound usually has more to do with the acoustics of your room than with the mic you choose.